The man suspected of killing 39 people in an attack on the Reina nightclub in Istanbul on New Year's Eve said the venue was chosen at random, local media report. Abdulgadir Masharipov said so-called Islamic State (IS) initially told him to attack an area in Taksim Square. He was forced to change his target because of heavy security in the area, according to the Hurriyet newspaper. 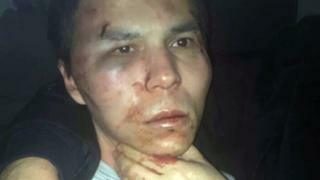 The Uzbek national was captured by Turkish police on Monday. Abdulgadir Masharipov said his instructions came from Raqqa, IS's stronghold in Syria, Hurriyet reports. "I came to Taksim on New Year's Eve but the security measures were intense. It wasn't possible to carry out the attack," he was quoted as saying. "I was given instructions to search for a new target in the area. Reina looked suitable for the attack. There didn't seem to be many security measures," he added. The BBC has not been able to verify the report in Hurriyet, which has not said how it managed to obtain the police interview in which the suspect makes his comments. IS has said it was behind the attack, which the group said it had ordered in revenge for Turkish military involvement in Syria. The attack on the Reina club was carried out by a gunman who arrived by taxi early that Sunday, before rushing through the entrance with a long-barrelled gun he had taken from the boot of the car. He then fired randomly at people celebrating the new year.